Take an adorable Pillow Pet and add the scent of favorite childhood sweet treats, mix gently, and you have a new line of subtly scented Pillow Pets. 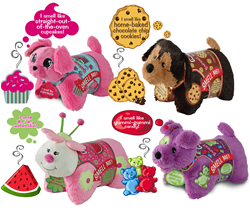 Sweet Scented Pets folding stuffed animals are ideal for any gift giving occasion including Valentine’s Day, birthdays and when simply delivering a sweet message to a friend. CJ Products, Inc., the creators of the iconic Pillow Pets foldable plush, are baking up a new line of sweet smelling foldable plush stuffed animals. Take an adorable Pillow Pet and add the scent of favorite childhood sweet treats, mix gently, and you have a new line of subtly scented Pillow Pets, Sweet Scented Pets. Sweet Scented Pets are ideal for Valentine’s Day gifts, birthdays, holidays, anniversaries and any occasion that calls for something sweet. The first Sweet Scented Pillow Pets introductions include three unique styles that feature a long-lasting scent patch. Sweet smells include all-time favorite childhood treats and desserts like chocolate chip cookies, candies, and cupcakes. CookiePup will comfort kids with the smell of home baked chocolatey goodness. GummiPup’s fruity scent of the favorite colorful gummy candy is anything but sticky. And PupCake can help celebrate any special occasion with the aroma of a sweet cupcake with hints of sugary fluffy vanilla frosting. Watermelon Ladybug sweetens up life with the juicy scent of watermelon. Perfect for playtime, sleeptime, or anytime, Sweet Scented Pillow Pets are surface washable and feature long-lasting scents that are sure to delight the senses. These confectionery plush pals will be available year round with new ‘flavors’ added seasonally. Visit Pillow Pets for more information. About Pillow Pets: Since 2003, CJ Products, Inc., the company behind the iconic Pillow Pets® brand of plush foldable stuffed animals, has been bringing smiles to the faces of people of all ages. The noteworthy jingle “It’s a Pillow, It’s a Pet” continues to have fans singing the catchy tune. The company fulfills its mission by providing unique, functional plush items and accessories with excellent customer service, strategic licensing partnerships, and products held to the highest standards of quality and innovation. The well-known folding stuffed animal is just one part of the Pillow Pets family of products which also includes Sweet Scented Pets, Dream Lites, Jumboz Pillow Pets, BodyPillars, Crazy Clingz plush wall art, and FabTablets. Pillow Pets continues to win accolades including the coveted iParenting Media Excellent Product Award, the Mr. Dad Seal of Approval, and Dr. Toy Best Vacation Products. For more information, visit the website. Pillow Pets, You can Feel the Fun!